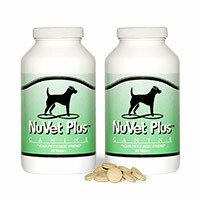 At NuVet Labs® we know that a major cause of poor health in our beloved pets is the lack of proper nutrition with their diets. This is the main reason we developed NuVet Plus®. NuVet Plus® is the culmination of 8 years of research and development, formulated with the goal of creating a nutrient-rich formula that would surpass mere vitamin replenishment. Instead, the supplement provides full-spectrum nutritional support that focuses on boosting your pet’s immune system and overall health. Keeping your pet’s immune system strong is crucial in today’s environment. Household toxins, fertilizers, pesticides, and even many of today’s pet foods leave your pet’s immune system susceptible. Regular and even premium brand pet foods can contain toxins, bad bacteria, and “meat by-products” (an industry term for anything other than meat). Other common ingredients are fillers like corn, wheat and barley. These food ingredients and other environmental factors are prime sources for poor health in your pet. 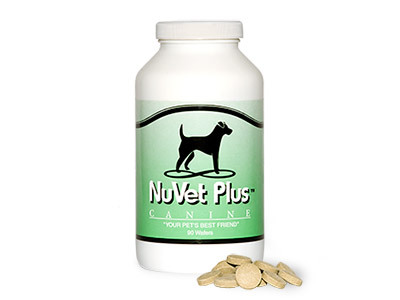 Our team of pet industry scientists, veterinarians, and medical specialists created NuVet Plus® to be a high-quality supplement that incorporates a precise formula of antioxidants, amino acids, vitamins, minerals, enzymes, herbs and more. NuVet Plus® brings together vital ingredients that perform synergistically to help improve your pet’s health and keep them healthy. Our supplement is made using Natural, Human-Grade ingredients that are formulated in an FDA-registered Pharmaceutical Laboratory. NuVet Plus® ingredients and nutrients are compounded to maintain their integrity and bio-digestibility for complete cellular infusion. We use special “paddle dried,” whole chicken liver that provides vitamin potency, as well as a taste your pet will love. Please view our full Ingredient List and descriptions to understand how these essential elements can help your pet get started on a path to optimal health as well as help them maintain a quality life full of vigor, vitality, comfort, and energy. Over the course of 8 years, the scientists, researchers and animal medical experts at NuVet Labs® perfected the NuVet Plus® formula. The goal was to create a superior supplement product that included human-grade ingredients offering outstanding nutritional benefits to both dogs and cats. In addition, the development process focused on the supplement's bio-availability and absorption into the cellular framework. When creating the formula, scientists also took into consideration the different toxins and chemicals that are often found in animal food products, such as dry pet food and treats. NuVet Plus® was formulated specifically to combat the negative effects of these pollutants. 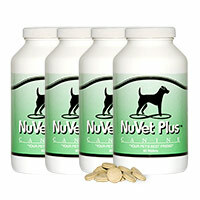 At NuVet Labs®, we believe our pets deserve the very best. Our advanced formula is comprised of the highest quality human-grade ingredients that work in combination to maintain and improve your beloved animal's quality of life. With its precise combination of natural antioxidants, amino acids, vitamins, minerals, herbs, and more, NuVet Plus® is a complete nutritional supplement that works to boost the immune system and helps defend your pet's body against free radicals. 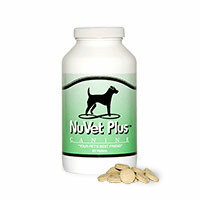 To find more information about NuVet Plus®, be sure to visit our NuVet Labs® reviews page. There, pet parents will find feedback from other people who have used our products. The NuVet Plus® reviews that are found on this page allow our customers to get the honest, first-hand feedback that they need when making this important choice regarding their pet's nutrition. Blue Green Algae, Brewer’s Yeast, Cat’s Claw, Evening Primrose Oil, Shark Cartilage, Oyster Shell, Alpha Amylase, Beta Carotene, Pine Bark, Papain, L Methionine, Alfalfa, Chicken Liver, Vitamin B1 (Thiamin), Vitamin B2 (Riboflavin), Vitamin B3 (Niacin), Vitamin B5 (Pantothenic Acid), Vitamin B6 (Pyridoxine), Vitamin B12, Vitamin D, Vitamin K, Manganese, Magnesium, Iron, Copper, Amino Acids (Tryptophan, Threonine, Isoleucine, Leucine, Lysine, Methionine, Cystine, Phenylalanine, Tyrosine, Valine, Arginine, Histidine, Alanine, Aspartic Acid, Glutamic Acid, Glycine). To jump-start your pet’s immune health and provide maximum support, please contact our Customer Service department for additional dosage recommendations. A: Our AutoShip program allows you to receive a 15% discount off of the product price for NuVet Plus®, and 10% off the NuJoint Plus® or NuJoint DS®. It is an automatic refill of your NuVet Labs® supplements; the shipping frequency is calculated according to the number of pets you have and how many supplements they each get per day. As a courtesy, AutoShip orders scheduled to ship on a holiday or weekend are generally shipped the preceding business day to help ensure that you do not run out of your pet’s supplements. You may contact our office anytime in between orders to make changes or to submit a cancellation request with our customer service department. Please note our Company does not send reminder notices prior to AutoShip refills. As long as you remain on the Autoship program you will continue to receive this discount on future refills.